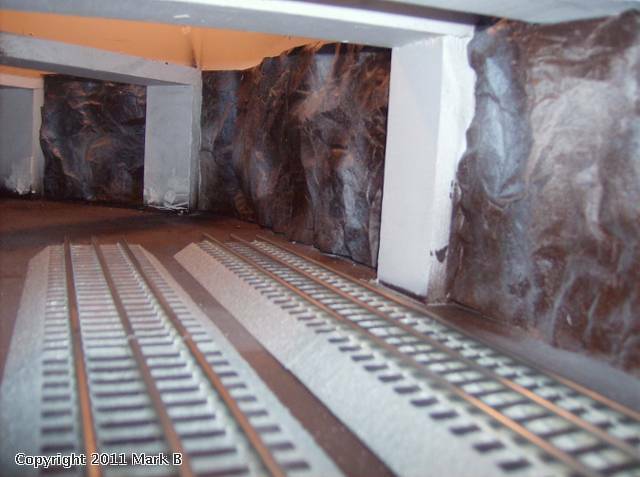 1) Covering the end pins with painters tape or little styrofoam squares, I spray the rail areas and the rails with black primer. You can connect two pieces together at once to speed things along, but have to quickly wipe down the rails on the top. This works nicely as you have black side rails(i know some prefer a rust color, but this actually looks prety good). 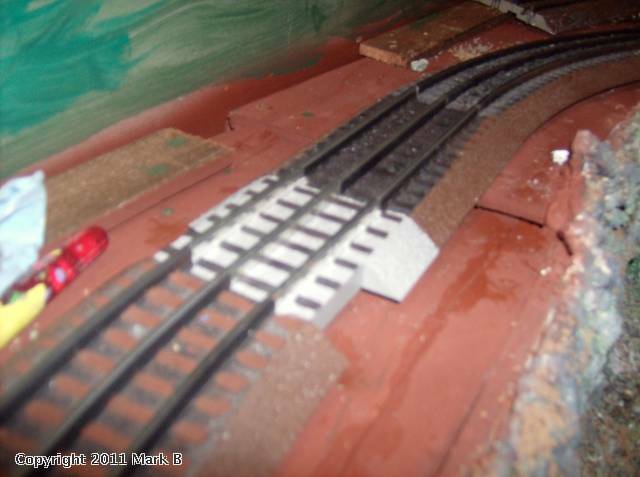 2) Using a 1' long, 6" wide pirce of card stock, held right where the ballast line meets the flat top of the track, I spray a brown primer along the sides. The trick here is to not get the rail ties hit with brown paint. The reason is next. 3) While watching a TV show etc., I now go back over each piece and paint the rails in the middle and sides the same primer brown color as the sides. Since in between the rails is black from the black primer, you end up with an excellent contrast. 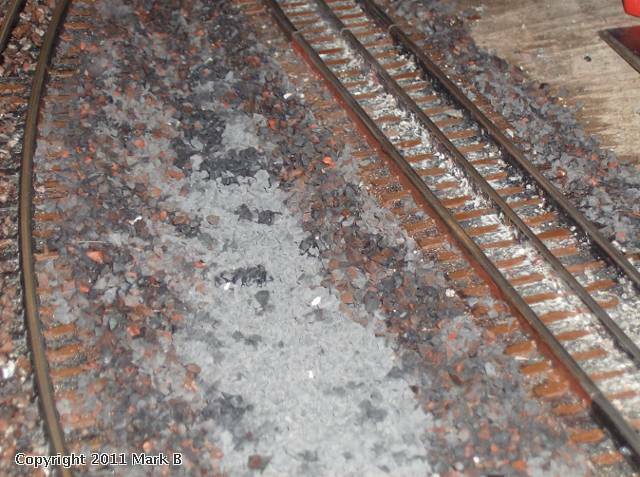 4) Once your track is laid you can now ballast it. 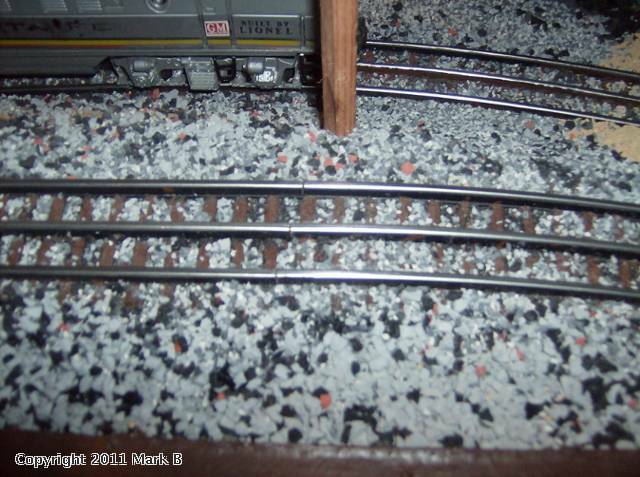 The ballast does cover the brown primered sides BUT there are alwasy some gaps. Leaving it the original gray would peek through, particularily at the juncture of the side and 'top'....that would keep me up all night long and drive me nuts. 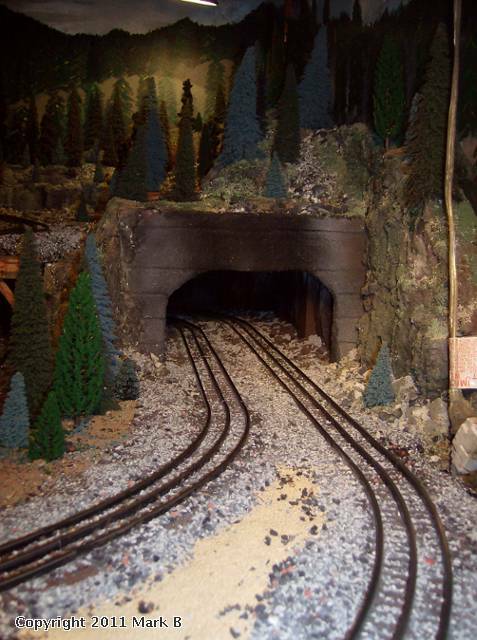 4) Ballast: I use Brummy's Lanscape Express,out of Barbeton,OH(dbrumagin4@netscape.net). You can aslo find Brummy's ad's in OGR Magazine. Brummy's is ground up colored rubber in a whole range of sizes and colors. Very easy to work with ans looks very real. It also has an insulating quality for Fastrack which as most of you know, can be loud. 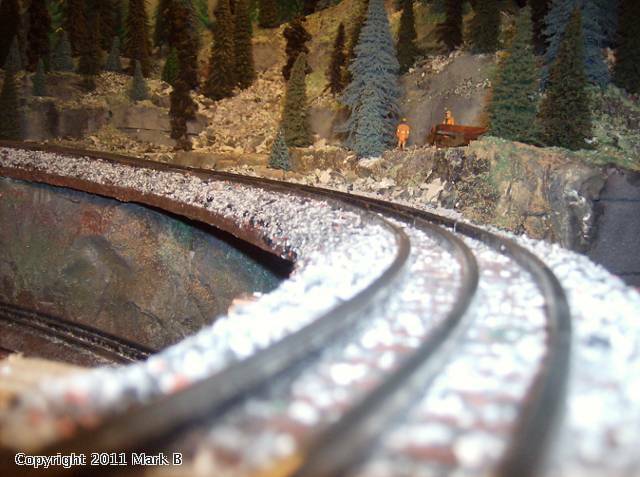 I spinkle the fine grain ballast between the rails and sometimes glue it with 50/50 Elmers Glue-water mix or just leave it alone. If a piece hit's a wheel it is simply jettisoned to the side and does to 'catch' a wheel and like a rock or harder ballast mix. This may sound like an insane amount of work. It is, but that is training and you learn as you go. My next layout will most likey us GarGraves or Atlas. 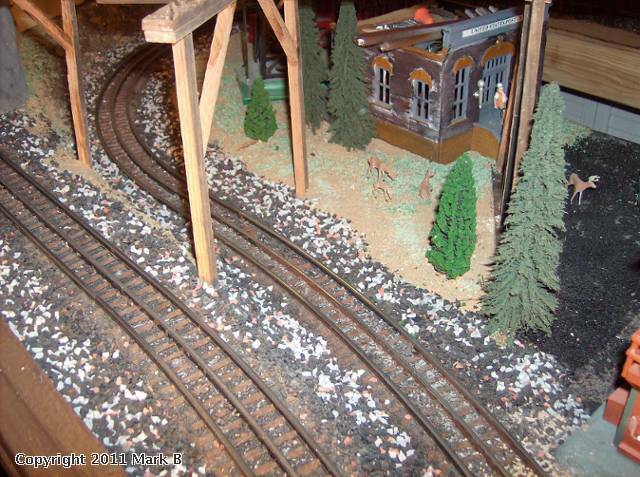 I even have the space to build on to the existing layout and just leave the existing Fastrack as is. The point is, if you like Fastrack or have a ton of it and your budget is tight, this is a great option to customize things. Please enjoy the folling pictures that show the evolution-progress that I went through. The final results look preety cool to me. Thanks for checking this out! Please let me know what you think. Mark B - this is a great topic, and I'm wondering if you have any more updates for us? It's great to watch your progress on this, and I'm sure many will benefit from learning how to customize Lionel's Fastrack.